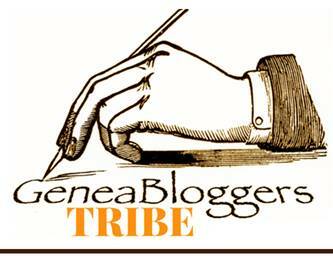 Cecelia GALLUP, daughter of Lodowick GALLUP and his wife Margaret "Peggy" PHELPS, was married to Giles WILLIAMS as his second wife. Giles WILLIAMS was first married to Cecelia GALLUP's sister Fanny Maria GALLUP. Giles WILLIAMS married Fanny Maria GALLUP on 13 Sept 1833 and she died on 16 Apr 1863 of diptheria in Worcester, MA. He then married Cecelia on 6 Dec 1864 in Worcester, MA. It is important to point out that his second wife was the older sister of his first wife. The 1850 census for Giles and Fanny Maria shows that they live in Worcester, MA. Both were born in Connecticut. The Gallup (2009) Genealogy, Giles and Fanny Maria have 9 children listed and they must be some living descendants of this couple. Giles and his first wife are buried in South Cemetery, Pomfret, Windham, CT. He died in 1869. Their graves can be seen on Find a Grave. Two children are also buried there. Ceceila GALLUP WILLIAMS died on 28 Jan 1892. 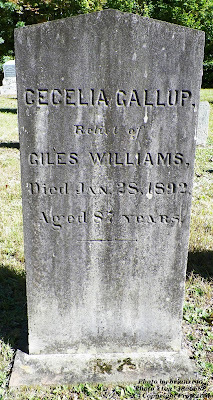 Cecelia GALLUP and Giles WILLIAMS had no children so that is why she is buried in the Gallup Cemetery without a husband.